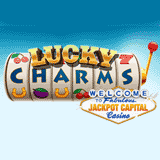 Frequent players are winning weekly bonuses up to $600 and even occasional players are cashing in on weekly random draws during the Lucky Charms casino bonus event that's just begun at Jackpot Capital Casino. They'll give away a total of $100,000 this month! At Jackpot Capital Casino you'll earn points when you play any of their hundreds of games, either online on their desktop or laptop or in the mobile casino on their smartphone or tablet. Every week Jackpot Capital will give $20,000 in casino bonuses to frequent players. The maximum bonus has been increased for this promotion. Frequent players win weekly bonuses up to $600; anyone can win random draws every Friday. Top point scorers get top bonuses, but even you just play occasionally you can still win random draws that award $5000 in prizes every Friday. That's just in time to help you improve your scoreboard ranking before they do their Monday morning bonusing. During the Lucky Charms Bonus Event you'll be notified of additional Lucky Charms bonuses via email and the casino’s Facebook page. Redeem all of them and you'll be eligible for a free $100 no deposit bonus at the end of the promotion. Jackpot Capital Casino offers hundreds of games from Realtime Gaming. The new Aztec-themed Secret Symbol slot is expected later this week.